I want to nip this in the bud right away, fruit juice. I know there is a common belief that 100% fruit juice can be healthy for you. Drink fruit juice as part of a healthy diet. You can have one to two servings of your fruit and vegetables by drinking juice. Lose weight with fruit juice. Well, there is only partial truth to some of these claims. There are two major issues with fruit juices. The first problem is: the sugar content. Have you read HOW much sugar is in one serving of juice, even 100% juice? There can be anywhere from 25 to 30 grams of sugar or more. Juice cocktails are even worse, some over 40 grams! Most people drink more than one serving at a time, so double those sugar grams, 50 grams of sugar in one sitting. We have talked about sugar and what it does to our insulin levels and the effect insulin has on our weight lose efforts. 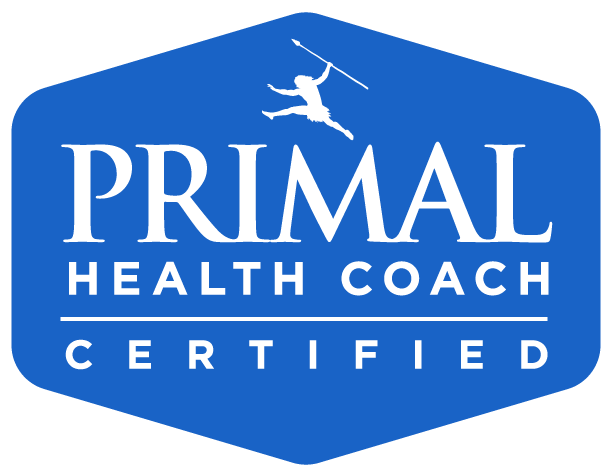 For a quick refresher, when our insulin levels are constantly elevated, we are in a weight gaining pattern. When they are lower, in the 90's, we are in a fat burning state. This is where we want to be, the "sweet spot". Also, remember when you peak and trough with your insulin levels, this puts you at significant risks for diabetes and insulin resistance. Do you think that 100% fruit juice is still good for you? I hope not. Also think about this, when a diabetic feels "low" as they say, one of the best things for them to drink is orange juice. It will quickly get into their system and raise their levels of sugar and insulin. Not what the rest of want. Even if you do fresh squeezed juice, you need several oranges to make a glass of juice. You would not eat three to four oranges in a sitting, but you can easily drink that much and more. The second problem: There is no fiber. No matter how many servings of fruit juice you drink, you will still not have any fiber. 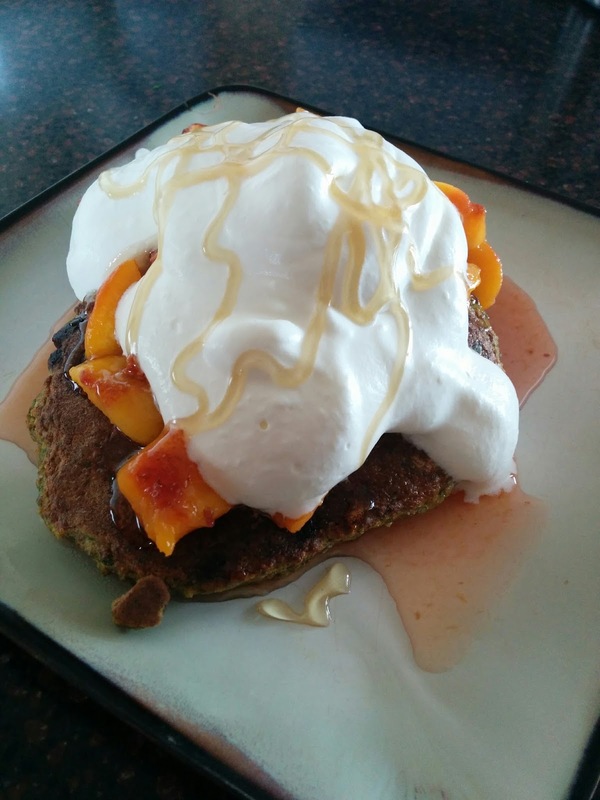 From those previous posts, we should remember that fiber helps to slow down the uptake of sugar in our system. This is why it is important to eat the whole piece of fruit, with the skins like apples and peaches, grapes or the pulp with an orange. When we eat the whole fruit, that fiber will slow the sugar uptake, thus you will not see a huge spike in insulin levels. Fruit juices do not have this protection. There intake should be limited to rarely. One of the worst times to consume fruit juices is before bed. Your body is going to put all of that insulin right in to fat storage. It will give you an increase in energy due to the sugar content and then drop you. This can actually cause difficulty sleeping. If you wake frequently in the middle of the night, watch the amount of sugar you are eating in the evenings. What I am sure you will find is, a large consumption of sugar in any of it forms. The drop in insulin will wake you up. The best way to combat this, along with limiting your sugar intake in the evenings is to eat some protein and a little fat. Nuts do the trick very well. Keep some nuts by your bed and when you wake up, eat a small handful and you should find you will go back to sleep quickly and stay asleep. Due to the fat and protein, your insulin levels are going to stay stable. Thus, you will sleep peacefully and soundly through the night. If you want to eat some fruit, the best way is to eat the whole fruit. Not only will you be getting the fiber, but their is also less sugar in a piece of fruit than there is in the same fruit juice. Be sure to not over consume fruit though, their is a lot of sugar in them, causing weight gain. Here we are again on Tuesday. The weeks go by so fast these days. This is a great time of year, the harvest season, so why not take full advantage of it? Pumpkin is another of my favorite vegetables, along with acorn squash. Hublet always tells me it is just the pumpkin spices I like, he thinks he has my taste buds... I do like the spices, I would have to say, however, I also really like pumpkin. Another great harvest of this time is apples. Let us combine them. You will also need a food dehydrator and fruit leather trays for your dehydrator. If you bought pumpkins to cook down, this is what I did with mine. I cut them in half, scooped out the seeds and saved the seeds. Turn the pumpkin face down in a baking dish. Add a bit of water. Place in the oven at 450 for about 45 minutes to an hour, depending on size. They are finished when tender to the touch or the skin has pulled away from the flesh. 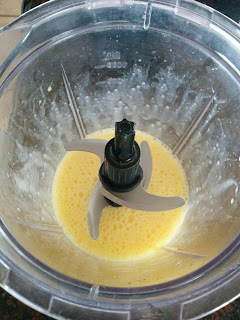 Remove the skin, place in a blender and blend until smooth. The extra you can put in the freezer for later use. Blend your pumpkin, apples and cinnamon together, until smooth, unless you want some chunks in it. It is your leather, make it the way you will eat it! For amounts, use the amounts you would like. Taste it as you are blending until you achieve the flavor combination you like. If you do like it sweeter, try using a sweeter apple first. If it is not sweet enough, add a little raw sugar. You do want to get to the point you do not need to add any sugar. Work on it and you can get there. Pour the mixture onto the trays and turn your dehydrator on to the temperature it says. Allow to dry to your liking. Enjoy! This is a great treat. There is a lot of fiber in both the apple and pumpkin, along with many vitamins and minerals. Because of the fiber, it will help to keep you full for longer periods of time as well. Fruit leathers are easy to make. If you do not like apples and/or pumpkins, mix your favorite fruits together to make a healthy, delicious snake for both you and your family! As a trainer and passionate about nutrition, I frequently hear it is too expensive to eat healthy. I have several family members who are on tight budgets for various reasons and they tell me they can not afford good healthy whole foods, it will blow their budgets. They have to eat junk food, fast food, dead food which causes weight gain and sickness. No matter how I try to tell them it is not expensive to eat healthy whole foods and in the end it is even cheaper, they do not want to hear. Junk food tastes better to them and they do not want to change their habits. Most people are in the same boat today with the state of the economy or being addicted to these foods. Yes, I did say addicted. With the amounts of sugar and chemical additives, junk food is even more addictive than cocaine. Even so called healthy food is nothing more than sugar laden fat causing pseudo dead food, which are addictive. This is how the manufacturers want their food though, addictive, because then you have to have it and you continue to buy more. They have very cunning marketing gimmicks to fool you into thinking it is healthy. Then, you are addicted and have to the food. Back to real healthy food being expensive. Think about it this way, when you go grocery shopping, where do you spend most of your time? Where do most of your foods come from? The middle of the store, the isles of processed foods or on the outer portions of the store, the produce and meat isles, the single ingredient items? You see, when you are shopping in the middle of the store with all of the processed foods, these are dead, have very low nutritional profiles, are laden with sugar, hydrogenated oils, high fructose corn syrup, HFCS, and various other chemicals. These foods do not provide our bodies with the nutrients they need, can cause diabetes, cancer, heart disease, metabolic syndrome, lack of vitamins and minerals and the list goes on and on and on. If you end up with any one of these disease, or several, you are going to spend more money than you would if you were eating real whole foods. Here, there is no comparison. The cost benefit ratio is out of this world. You will spend more on a heart attack or cancer treatment than if you ate healthy food your entire life which can ward off these diseases. Makes eating healthy not seem so expensive does it? When you are eating these types of foods, you also have to eat more. For example, if you drink a can of soda and eat a bag of chips, in about an hour, if not shorter, you are going to be hungry again. When you are drinking soda, their is no signal to your brain telling your stomach is full, so you eat and eat. The chips have nothing really that healthy in them either. Your brain nor body receives the nutrients they need to function and thrive. They go through your system quickly and you are hungry again. Not only that, but you have a sugar crash and your body needs it's drug, sugar. You reach for a doughnut, more soda, candy or so called healthy foods. The cycle continues on. With this, you eat more food and thus more calories. On the other hand, when you are shopping on the outer portions of a store and thus eating whole foods, your body and brain are fed. They receive all of the nutrients they need when we eat a variety of vegetables, fruit, meat, poultry, eggs, fish and fats, like butter, and cream along with nuts and seeds. You actually will eat less food when consuming real whole food. Even Hublet admitted to this, when I eat healthy foods, I need less. That is big, coming from Hublet! Protein and fat take longer for our bodies to digest, you are full for longer periods of time. When we eat fiber, it will create more bulk in our stomach, and we are full for longer periods. Your blood sugar levels are going to be stable and even in a fat burning zone instead of peaking and troughing, causing diabetes and a host of other diseases, when you are eating real food. If you are eating less food, you are automatically saving money! When we eat healthy, we maintain our health. We are not going to the doctor and having to take prescription medication or over the counter medication, again saving money. You could possibly not have to take a multi-vitamin or other vitamins if you are eating real whole foods. Again, saving money. By avoiding the processed, pseudo dead food, both food and drinks, we have more money to buy real food. When you go grocery shopping, try to have 90-95% of you shopping cart filled with single ingredient items, shopping on the outer portion of the store. Those foods which you do buy from the inner portion, be sure you can read every ingredient and know what it is. Or, instead shop at farmer's markets, fruit stands, buying local food. When the end of the season comes around, stock up and freeze o dry foods for alter use. Buy in bulk when you can with your meats. Buy a cow. If you can not eat the whole thing, split it with family or friends. Some butchers will sell half or quarters of a cow. Grow your own produce, it is not as hard as it sounds. If I can grow produce, anyone can. Have chickens for your eggs and then poultry, if you are allowed to. You can even sell the extras to neighbors. 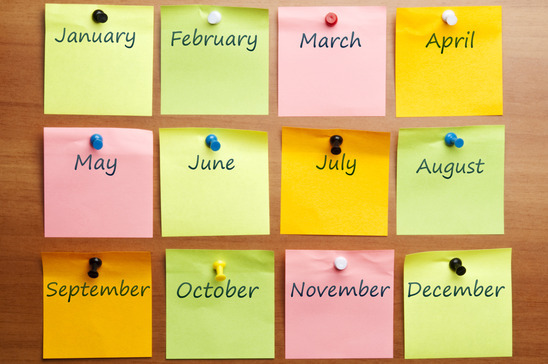 Plan a weeks worth of meals before you go shopping, know what you need and stick to your list. If you know a particular isle is tempting for you, do not go down it. In the end, you will see your bill go down. But more importantly, your health will improve, weight will fall off and you will feel alive and better than you ever have! Here is a great article on this issue which has some tips. There are links at the bottom to other articles which show you more money saving tips and tricks and even one showing how cheap healthy food can be. It can be cheaper than junk food. I love acorn squash. This began from my Mommmy making it when I was growing up. When it came time for fall and the harvest season with the winter squashes, she would make this recipe, something similar any way. I loved it! I would ask for it every meal and would wait in patient anticipation for fall to arrive so we could have it. Thank you for the delicious recipe Mommy! Yes, even Hublet enjoys this recipe. The first time I made it, he was not so sure because of how he had had squash growing up, which was not very good. But, after the first try, he was in agreement with me of it deliciousness. Cut the acorn squash in half, the long way, they are more oval than a circle. Scoop out the seeds. Depending on the size, I use either a large spoon or an ice cream scoop. If you would like, save a few seeds to plant for next year, or you can dry them and eat them like you would pumpkin seeds, or put them in your mulch pile. I then slice in the the flesh a little way so the butter, raw sugar and cinnamon will seep deeper into the flesh. Place butter, raw sugar and cinnamon in the center and up the sides, if you wish. Place in a deep baking dish with a lid. Put the lid on and bake at 350 to 450 degrees Fahrenheit, depending on how fast you need it cooked and how big it is. It will need to cook for anywhere from 30 minutes to an hour, again depending size and temperature. It is finished when the squash is soft to the touch. 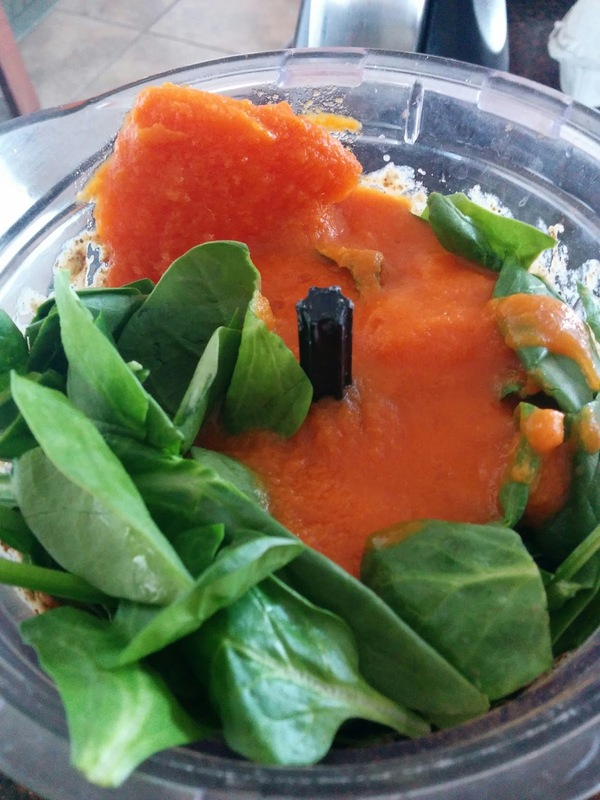 Take out of the over, allow to cool until you can touch it, then scrap the sides and bottom of squash and mix it with the goo. Enjoy! Hope you enjoy this recipe as much as we do. Is there something better than chronic cardio? Why yes there is! We have tackled HIIT training and the benefits of training this way. But lets talk about about sprint training, the benefits and why we want to sprint. Chronic cardio is long and boring, in my opinion, and does not get you the results you are looking for. The reason for this is because you keep your heart rate in one range. Yes, it takes work to get it up to the range of a jogging speed, but once it is there, it stays in the same range. You will stop burning as many calories. For woman especially, your body will adjust to this type of training. What these means is, your body will stop burning calories when you perform long cardio, like jogging. Our bodies, our muscles, have this great way of realizing chronic actions, which in the long run is good for us. It works against us though when we are trying to lose weight. Guys tend to not have as many problems with this. This is due to our different types of muscle. This is why you see woman who run miles and miles, spend hours doing chronic cardio and their bodies do not change. It makes you wonder why they continue on the same path when they have not seen changes in their bodies for months, even years. If you do not change the way your work out, your body is not going to change. The reason sprint training is so wonderful, is we bypass all of these issues. When sprinting, you will increase your heart rate to its upper max and then when you are recovering, it will come back down. This processes is repeated over and over, yielding a higher calorie burn and our bodies do not plateau. You also build muscle while sprinting. It takes more muscle to sprint than distance running. Have you seen a sprinter with little to no muscle? No, we see them as very stronger, ripped built bodies. It is the distance runners who have no muscles and look frail. It takes a decent amount of muscle to sprint across a field or to get a way from a hungry bear! To have a higher metabolism, we need more muscle. Muscles have to eat and be feed, this is done by food. The more you want to eat, the more muscle you need to have. Sprinting is a great way to build muscle and burn mass amounts of calories, in the end, to get into shape. By sprinting you can build a long lean ripped body. A body which will turn heads and everyone will be wondering what you do. When everyone else is out there wasting hours doing long cardio, you can smile when you are finished with a workout in less than a half hour and your body actually has something to prove for all of your hard work. The fat whittling away! Sprint has hard as you can for about 30 seconds. It does not sound long, but believe me, it is harder than it sounds. Nicely walk back to the starting position, take about a minute and half to two minutes. Repeat process as many times as you can. When first beginning you will not be able to do very many, maybe three to five if you are in decent shape. You want to push your body, but to the point of killing yourself. Listen to your body. Work up to dong 15 sprints. You really do not need any more than this. If 15 intervals is too easy, sprint harder, do winds sprints or up hill sprints. For frequency, you really only need to sprint once a week. Make sure when you do sprint, you have a lot of energy. If you do not have the energy to go all out, then do not sprint that day. Sprinting will take everything you got and then some. Listening to your body is very important. Also, you do not have to do this with running. 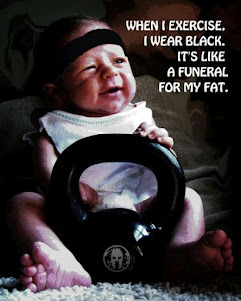 You can sprint on a bike, or swimming, with kettlebells, really anything you would like. Just perform the exercise in the same fashion. Sprinting will be the hardest. My favorite place to do my sprint training is in a grassy field. There is one not to far from my house that I take my two dogs too. They love to run and play at the field. In fact, right now they are not very happy with their Mommy because it has been raining here in Utah and is cold, we have not gone to the park in two days. They are sulking and letting Mom know. When the Boys are running and playing, I do my sprint training. I do it barefoot. This is one of the reasons I like sprinting in the grass, I can do it barefoot. It is also softer on the body than the pavement. Get out there and start sprinting! See amazing fast changes in your body. I have to admit, I am a huge fan of pancakes! When I began eating primal and found out I had a gluten intolerance, this is one of the foods I missed most, lame, I know. 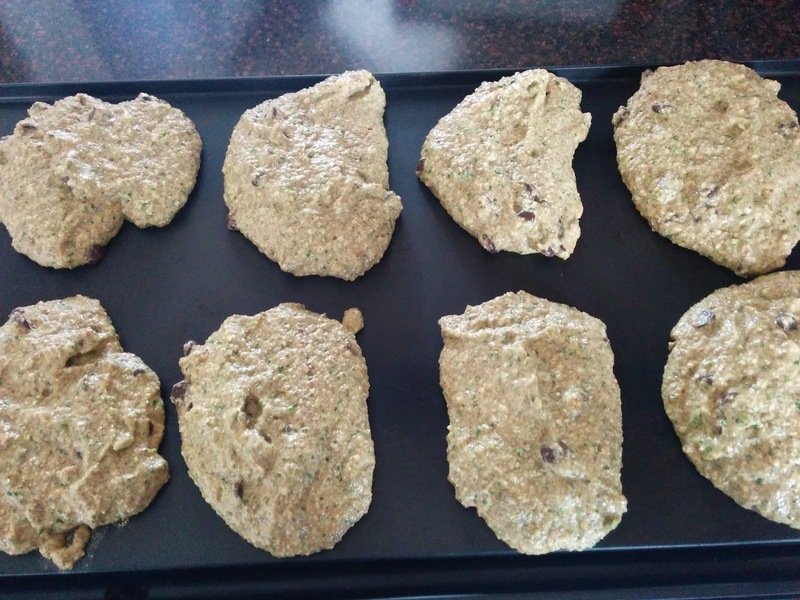 I tried a few different ways of making pancakes, but they did not turn out so well. 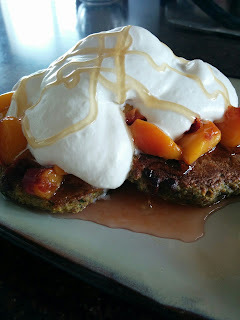 When I came up with this recipe, I must admit I was addicted right away. It is seldom there are not some in my fridge. *I fill my coffee grinder to at least cover the blades but no more than the max fill line Then I add additional of any of them or liquid for the consistence I want. For the nuts and seeds, find the combination you like best, they all change the texture and flavor so try different ones to find what you like best. 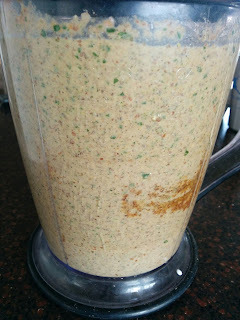 I like flax, chia and pumpkin best and when I want a variation or have others on hand, I add it in. 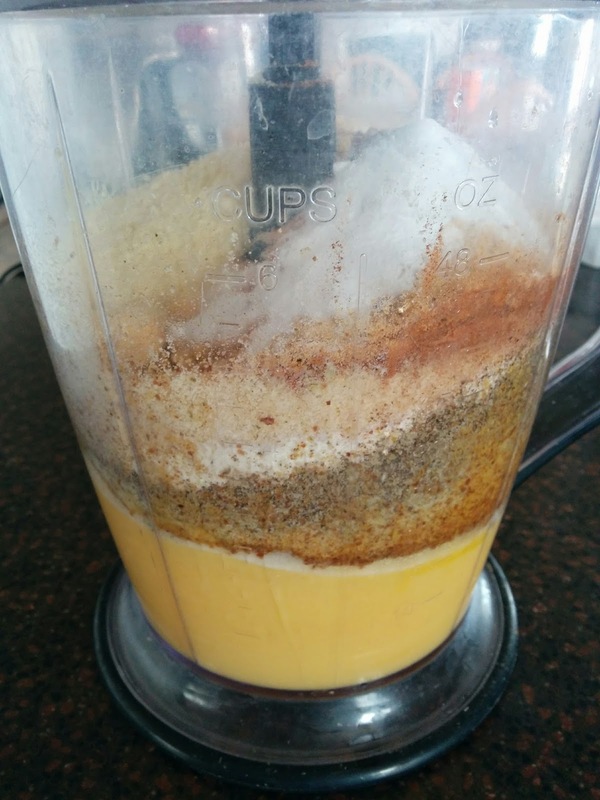 Crack eggs and blend well. 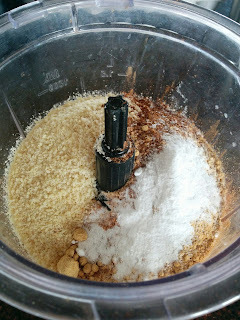 Grind all the seeds/nuts in the coffee grinder. Once ground, place in the egg mixture. 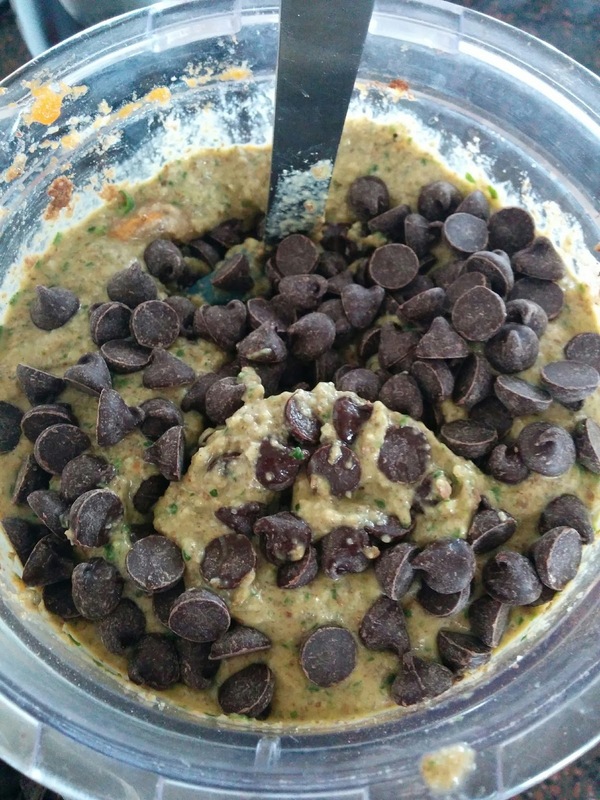 Add all the other ingredients, plus any extras you are going to add, unless it is chocolate chips, add those at the very end and mix in with a spatula. Blend all the ingredients until well mixed. Adjust liquid to your liking for either thick or thin cakes. Cook them on your pan or griddle to your liking of doneness. I really like to cook them in bacon grease, makes them a little crispy on the edges and tasty really yummy. They are yummy plain as well. These save well and reheat easily. I always make a large batch and then have breakfast for several days or a snack when needed. They pack well also. Be sure to make a large batch so you have left overs. Saving the world one stick of butter at a time.